Kangaroo Beach, pontoon pier built by the 1st Royal Australian Naval Bridging Train. 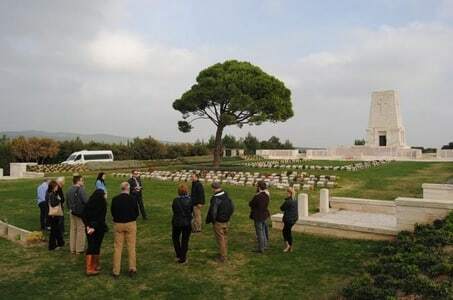 Hill 60 Cemetery, the most important New Zealand site in the northern part of the Gallipoli Battlefield. 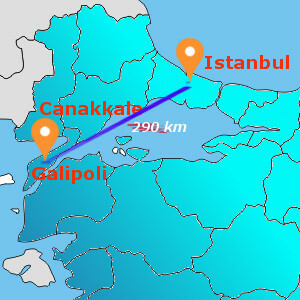 Green Hill Cemetery, lies on the east side of the Anzac – Suvla Road. Scimitar Hill, with three divisions it was the largest singleday attack ever mounted by the Allies at Gallipoli. Hill 10 Cemetery, the hill was taken by 9th Lancashire Fusiliers and the 11th Manchesters on the early morning of 7 August 1915. Azmak Cemetery, graves of 16 small battlefield cemeteries were concentrated here. A Beach, 11th division and 34th Brigade landed first in order to take the Hill 10. Kiretch Tepe, in other words Kireçtepe Ridge was originally one of the hills on a ridge called Kizlar Dag. End of tour depart to Istanbul at around 17:30. 22:00 Arrive Hotel in Istanbul.